← FYI–Seinfeld was NOT cancelled. This recipe makes a ton, great for keeping some for your family while assembling a pan for a family who needs a meal. I usually do 2 13x9s or 1 13×9 and 2 8x8s. You can freeze it as well. Preheat the oven to 350 and start making the pasta. Saute onions until translucent in a dutch oven, add sausage and mushrooms and cook until everything is done. Drain sausage grease off. Throw in the garlic and cook another minute. Add spaghetti sauce and simmer 15 minutes or so. Mix together the sour cream and ricotta. Mix the cooked pasta and the sausage-sauce mixture. Assemble as follows: layer of pasta/sauce, 1/2 cheese (either a layer of sliced provolone or just 1/2 the grated), 1/2 sour cream-ricotta, repeat, then end with a last layer pasta and parm on top. 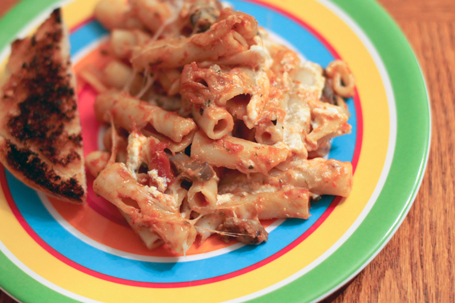 If you have extra pasta, freeze it as “penne with meat sauce” as a quick lunch or dinner sometime when you need it. The baked ziti needs to bake until everything is melted and warmed through (~30 minutes, more if its straight from the freezer). I bake it mostly covered and then uncovered at the end. Wow! You don’t have to cook the pasta? Awesome! I’m filing this recipe!! I am curious: have you ever tried assembling this, and then freezing it before cooking? I always love to make extras for a “rainy” day when I need a fast meal out of the freezer. Do you know if it would turn out alright if prepared this way? Thanks for the great recipe! You do have to cook the pasta but it does freeze well. As does the extra pasta and sauce! This looks delicious! Rumor has it a friend just gave birth to her third little one… Time to cook an extra meal. Thank for sharing the recipe! Uh-oh, Kristen. I’m in the middle of making this, just putting it in the oven actually, and I’m not sure how long to bake it. Thirty minutes perhaps?